Freedom-pharmacy.com is a discount internet pharmacy, offering name brand and generic oral, topical, and inject-able medications. There website states they have over 5000 different medications and have been in business since 2001. They also state that all of their products are genuine and kept in a clean controlled environment until shipped to the customer. Their site claims to have a pharmacist on staff, and customers have an option to “ask our pharmacist, click here for expert advice”. No name is given, so we have no way to check the legitimacy of his or her credentials. All clicking this button does is open an email option. Freedom-pharmacy does not require a prescription to purchase any of their medications, and it should be stressed that it is illegal to purchase prescription drugs in the United States without a prescription from a licensed doctor, and for customers protection we would advise you not to do so. 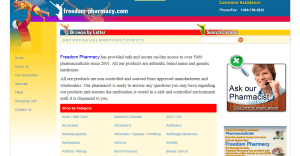 Freedom-pharmacy.com offers a wide variety of medications, therefore their prices vary depending on product and quantity. This site appears to sell in quantity (no per pill pricing) so if you only need 20 of a particular medication and it is only offered in quantities of 60 you have to buy that (so you may pay more than you would at other sites). Freedom-pharmacy.com ships via standard airmail (10-28 days), it may take longer if an item is back ordered or out of stock, and there is no order tracking on this option. They also offer delivery through international registered airmail (10-14 days), order tracking and signature required upon delivery. No prices are given for either of these options. They are also unable to ship to Germany, Canada, Australia, New Zealand, Indonesia, and Nigeria. Freedom-pharmacy.com only accepts the following payment options, electronic checking account payments (e check or ACH), physical check or money order, and direct deposit (10% discount). They accepted Visa at one time but “this option is currently unavailable” and no reason why is given. They offer a toll free telephone/fax number, general email, and pharmacist email for customer service. We did not try any of these options therefore we cannot attest to legitimacy or effectiveness. No testimonials or feedback are available on the freedom-pharmacy.com website. After thorough research our investigators discovered message board, third party, and independent reviews. Some of these reports were favorable, customers stating good experiences with this company. Other reviews stated, longer than promised shipping and delivery times, never receiving their order (or only receiving part of it), not being able to get a refund for orders not received, and fraudulent charges on their credit card. The NABP (National Association of Boards of Pharmacy) recommends not using this site as they do not appear to be in compliance with state and federal laws or NABP patient safety and pharmacy practice standards. The trusted website Scamadvisor.com had this to say. We did not locate any coupon codes for Freedom-pharmacy.com, but they do have the following specials currently listed on their website. Given the information from Freedom-pharmacy.com’s website, the third party and independent reviews, and the reports from Scamadvisor.com, Legitscript.com, and the NABP we only give this site a 2 out of 5 stars. They do not appear to be a safe and trusted source for customers to transact business.